7 pin ‘S’ type plugs and sockets are usually used on caravans to supply power to the reverse light and give auxiliary power to other systems such as fridges, internal lights and charging systems. This was replaced in 2008 by the 13 pin Euro plug on all new caravans. It is recommended that a split-charge relay should be wired into your ‘S’ type caravan wiring. At a set voltage this relay will divert the power that usually charges you vehicles battery to the auxiliary systems in your caravan. This is useful for charging auxiliary batteries and powering appliances like fridges and freezers while you are driving. Click here for more information on split-charge relays. Below is the wiring diagram for this plug and socket. 7 Pin ‘N’ Type trailer plug wiring diagram. 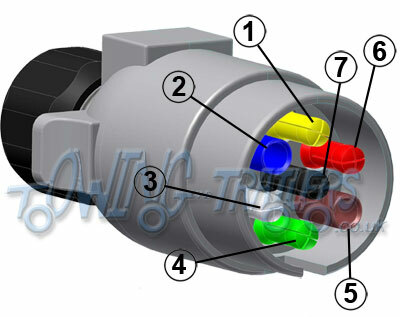 13 Pin Euro plug wiring diagram. 7 way universal bypass relay wiring diagram.